3/8" / 1/2" super duty adjustable 60 degree air ratchet wrench. 1. Square drive: 3/8" / 1/2". 2. Capacity(bolt size): -3/8", (10mm). 3. Net weight: 2.6 Lbs (1.3Kgs). 4. Overall length: 10 "(256mm). 5. Air consumption: 5 Cfm (140 L/Min). 6. 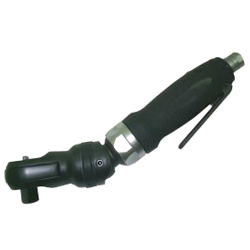 Air hose: 1/4" (I.d.). 7. Air inlet: 1/4" (Pt). 8. Free speed: 180 Rpm. 10. Max.torque: 50 Ft-Lb(68 N-M). 11. Packing(Kgs): 20 / Ctn / 26 / 0.8’. 12. TR-5532 with 3/8" anvil. 13. TR-5533 with 1/2" anvil.